Published bi-monthly (six print issues per year) newdesign is the magazine that covers the products and processes of design in all its forms. newdesign also follows the changing nature of design increasingly involving more scientific approaches to research, market analysis and innovation. It reflects the fact that the designer is involved in the whole process of market identification through to product delivery rather than just being at involved at one stage in the process. Most importantly of all, newdesign is a magazine that can be read and enjoyed not only by those directly involved in the design industry, but anyone with an awareness and interest in good design. Building on its core focus on product and industrial design, the magazine reflects the increasing multi-disciplinarity of design with coverage of communications, interaction, environmental, and digital design amongst a number of other sectors. The magazine prides itself on providing feature articles, comment, analysis and inspiration for the creative industries. 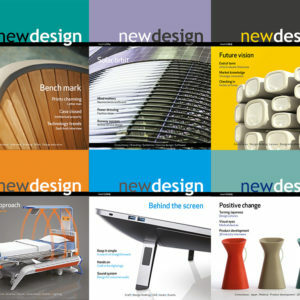 Click on the relevant subscription rate below to start your subscription to newdesign today.